Dr. Breunig specializes in glaucoma and cataract treatment, as well as comprehensive eye care. He is originally from Madison, Wisconsin. 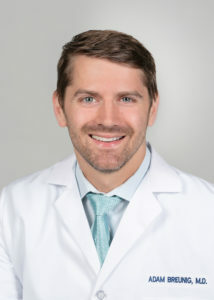 He completed his undergraduate and medical degrees at the University of Wisconsin before He completed an ophthalmology residency at the University of Minnesota and a transitional residency at Gundersen Lutheran hospital. Afterwards, he went on to complete a glaucoma fellowship at Northwestern University in Chicago. After his fellowship completed, he remained in Chicago, where he spent four years in private practice. He has presented posters at the American Glaucoma Society meeting and co-authored book, and journal articles related to glaucoma. Dr. Breunig lives in Lakeland, where he enjoys spending time with his wife and 2 year-old son. Frank J. Fischer Jr., M.D. Frank J. Fischer III, M.D.